"Shopify" Reviews (Apr 2019) - Why 4.6 Stars? Shopify is an awesome resource if you're looking to build an exclusively eCommerce site. The Shopify experts "get" merchants' needs and cater their fully hosted packages to meeting them. You pay a bit of a premium for added and advanced features, but it's pretty easy to find a plan that fits your expectations within your budget. “Shopify is easily one of the more well-known eCommerce web builder platforms in the hosting industry. Plans are fully hosted, include a free site builder tool, and allow you to boast an unlimited number of products with unlimited file storage as well. Compared to other web hosts, Shopify's not going to offer you the same level of robustness in their technological offerings, but their eCommerce features are on point. Online store building is their bread-and-butter of services, and they're darn good at it. “The great thing about Shopify is that the feature set centers around eCommerce, a focus of many shared hosting shoppers. Shopify plans are fully hosted, but even their most basic plan is more costly than a majority of the shared hosts we've come across; however, if you're serious about building an online store, Shopify offers a broad range of plan options and feature additions to make that happen within a reasonable budget. Plus, you can host your business at a complimentary MyShopify.com subdomain, or at a new or existing domain of your own. Toby Sembower (HostingAdvice.com): This rating is not available yet. We haven't evaluated Shopify for the "Dedicated" option yet as they do not currently offer this type of hosting service. We're always working to keep our reviews up-to-date so check back later! Does Shopify already offer the "Dedicated" option? Let us know. Toby Sembower (HostingAdvice.com): This rating is not available yet. We haven't evaluated Shopify for the "VPS" option yet as they do not currently offer this type of hosting service. We're always working to keep our reviews up-to-date so check back later! Does Shopify already offer the "VPS" option? Let us know. “While Shopify isn't your traditional web host, WordPress fans can take advantage of Shopify's eCommerce capabilities. For just nine bucks a month, you can integrate a Shopify BUY NOW button into your existing WordPress blog. The Shopify experts will generate a few lines of code for you and — voila — a stand-alone storefront is made for your site. 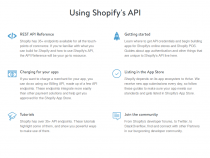 Plus, you can customize via the Shopify API. “Shopify is a fully hosted web building platform that specifically serves the eCommerce niche. All plans include a free site builder tool and you can browse the Shopify Theme Store for a design that most closely matches your brand. Themes are fully customizable, i.e., drag and drop elements or manipulate via the Shopify API. Best of all, you can start building your eStore at no cost with Shopify's 14-day free trial. 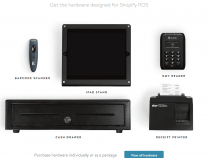 It's easy to sell an unlimited number of products with the Shopify Stripe Payment system. Merchants can sell via Facebook or other social media platforms, by adding a BUY NOW button, or using the Shopify POS system. You can upgrade your Shopify POS with the Retail Package add-on, making it easy to track your employees' sales with individual PINs. The package includes a free barcode scanner, cash register, and receipt printer, so you can safely accept and maintain all payments. Over 243,000 merchants trust Shopify. Build your business up, offering clients everything they need to launch an online store, with the Shopify Partners program. Shopify partners with agencies and freelancers, allowing them to earn 20, 70, and 80 percent of sales for client referrals, eCommerce themes, and apps, respectively. Get access to exclusive resources to expand your business, including marketing materials, workshops, webinars, and private forums. All plans are fully hosted and include a web builder tool, so you can actually build and host a virtual store with Shopify. WordPress users can also integrate Shopify into their existing Wordpress hosted website relatively easily. 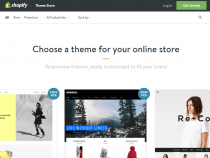 The Shopify Theme Store includes hundreds of free and premium Shopify themes for you to use to customize an online store to your liking. Shopify theme development can easily be manipulated via the Shopify API. Best of all, you can start building your online marketplace at no cost and select a plan later. Shopify offers a FREE 14-day trial, because they're that confident you'll love them. Fraud analysis tools are included with the Shopify Payments system. Orders can be created manually on all plans and merchants can choose to implement discount codes to entice buyers. The eCommerce deals only get better with each plan upgrade. Premium users can gain access to advanced reporting features, abandoned cart recovery, gift card capabilities, and even a free SSL certificate. All plans included 24/7 support from the Shopify experts and the USPS shipping label discounts increase as you upgrade to the "Basic," "Pro," and "Unlimited" plans. Shopify makes it about as easy as feasibly possible to get started: beginning with a 14-day free trial. Their website is pretty intuitive and lays out everything you need to know before making the plunge to pick a plan. Overall, you're going to get more robust technology with a web host, rather than an eCommerce web builder, but Shopify's ease of use is pretty great. Shopify pricing can get pretty lofty — reaching $299 dollars for the "Unlimited" monthly plan — but their "Basic" and "Shopify" plans offer plenty of features to get your online store built and online relatively painlessly. With each hike in cost comes a package upgrade that includes added eCommerce features, like gift card functionality or advanced tools for reporting, shopping carts, and shipping. Depending on what your online store building needs are, you can certainly find a Shopify package that suites your eCommerce expectations. Don't forget: it's all fully hosted! Shopify services are fully hosted, but you can't expect an eCommerce platform to be as robust as some of the more advanced exclusively hosting companies' technology. They don't offer an uptime guarantee, as you'd expect to find with more traditional web hosts, but they do offer the 24/7 assistance of the friendly Shopify experts. Wondering how Shopify stacks up againt other web hosting services? See our host-vs-host reviews below and compare them side by side. 2 out of 9 times. The Shopify experts have built a platform from which anyone can easily launch an online business, and customize it to match their personal brand via free and premium Shopify themes. All packages include fully hosted services, a free site builder, and a boatload of eCommerce features that only increase and advance with each plan upgrade. All in all, if you're looking for an exclusively eCommerce website, Shopify makes it super easy to boast an unlimited number of products and accept payments for them via a multitude of ways (e.g., social media, a flashy BUY NOW button, or the Shopify POS system). If an eStore is what you need, Shopify can help you create it.